The machinery and construction equipment are an unusual sight at the sylvan and scenic Shaver's Creek Environmental Center. In a few months, though, they will begin to disappear and Penn State's nature center in Petersburg will once again be open to the public. Shaver's Creek is nearing completion of the first phase of its first major expansion and renovation in its 41-year history. The site has been largely closed to the public for more than a year, and major construction work began in March. "We’d hoped to start it August a year ago, but just through the permitting process we weren’t able to start until March of this year, which pushed us back," said Joshua Potter, educational operations manager. The $5.8 million project -- funded by Penn State Outreach and through private philanthropy -- will expand the ability to offer programs and experiences for the approximately 60,000 community members and students served by Shaver's Creek each year. Construction is expected to be completed in January, and parking lot repaving and landscaping will take place in the spring. Potter said the center will have a soft opening in the spring, when the public can visit again and summer camps will be held in the summer. A grand opening celebration is expected for Labor Day weekend. "We’ll have a big welcome party, a weekend of walks, programs, music, that kind of thing, to celebrate the new facility," Potter said. The upgrades include a new classroom building, renovations and enhancements to the visitor's center, the addition of an administrative and office space, a new maintenance building and improved ADA accessibility, HVAC systems and electrical service. At the heart of Shaver's Creek is the original forestry lodge -- built in 1938 and used by Penn State's forestry school until Shaver's Creek opened in 1976 -- that serves as the visitor's center, Discovery Room and book store. The core is being kept in tact but renovated and the new office building will be attached to it. The lodge will have a new book store, new entrance and in the back a landscaped terrace and outdoor teaching space. Potter said Clyde Peeling's Reptiland is helping to build a herpetology center with tanks for turtles and snakes. The tanks will be flush against the wall and accessible behind the scenes for staff. More exhibits will be on display as well. The renovated visitor's center will lead out to the existing outdoor pavilion, which then will connect to the new classroom building. That building will have two classrooms with a moveable wall to give the ability for one large space for up to 100 people. "We teach about 35 [university] classes. Some of them on campus but a number of them out here as well," Potter said. "Having that at the same time as school groups coming to visit, team-building programs in the front yard, visitors just coming to visit the animals – in inclement weather where do they all go? Having that capacity is exciting." 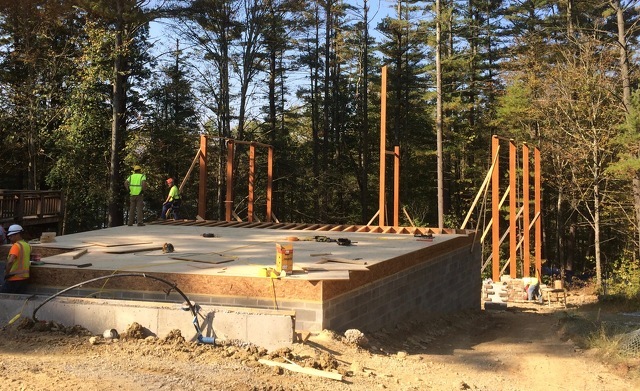 It also will have kitchen facilities and public restrooms, which will help with events like the annual Maple Harvest Festival usually held in March (it will return in 2019) where 12,000 pancakes are served over a weekend at the outdoor pavilion. 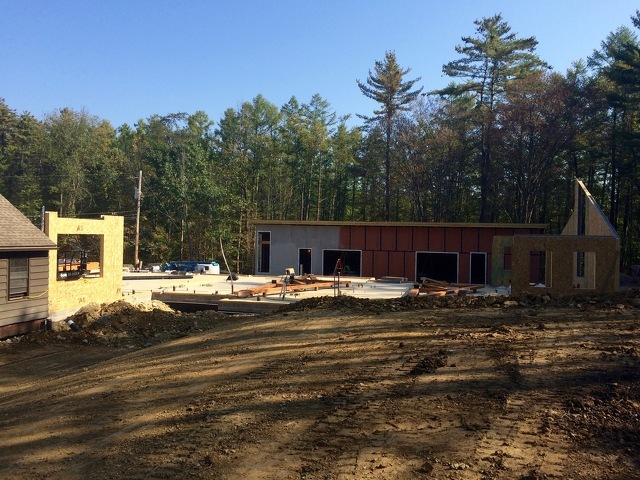 Work is under way on construction of the new classroom building at Shaver's Creek. Attached to the existing lodge, meanwhile, will be an expansion with office space for about 25 staff and volunteers. "Our staff has been tucked in little module buildings all around, in the back of raptor enclosures or the wood shop," Potter said. 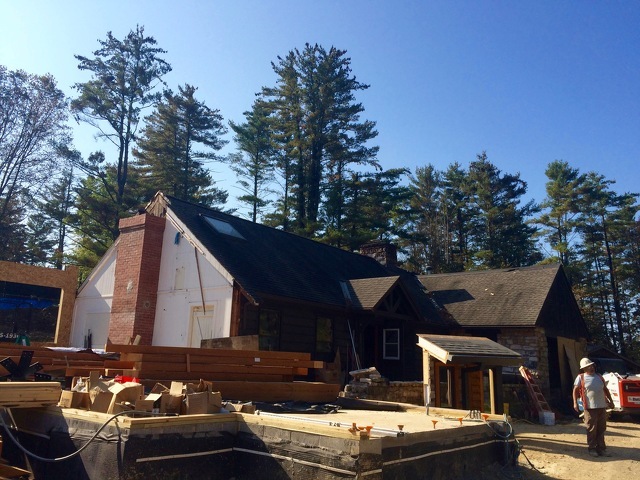 The new part of the building is designed to blend well aesthetically with the old lodge. It's also an example of the environmentally-sustainable elements of the upgrades at Shaver's Creek, which is aiming to achieve LEED certification. Wall panels, for example, are designed for high efficiency and also use some (very) locally sourced wood. Potter explained that the Pennsylvania Game Commission is partnering with Penn State at Stone Valley, about 2 miles from Shaver's Creek, to improve the woodcock habitat. Some wood was being removed to open up the habitat. "It stayed right where it was cut and we brought a portable sawmill on site," Potter said. 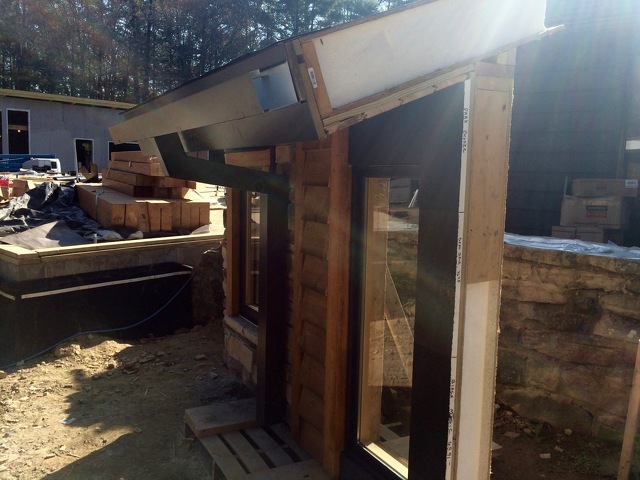 "Some of it, like the hemlock, we were able to just keep on site because it’s going up rough-cut. It never left the site. It was cut, milled and now it’s being stained and applied right here." West Penn Power Sustainable Energy Fund, meanwhile, recently awarded Shaver's Creek a $35,000 grant to install sustainable energy technology. That funding will be used for variant refrigerant flow HVAC systems. While the site has been closed to the public since last September, Shaver's Creek staff have continued their work. Some Penn State classes normally held on site have been held at Camp Blue Diamond, where the center also continues to host its residential outdoor school program. "We do have some Penn State classes that are associated with our festivals," Potter said. "Our students are interpreters for the interpretive trails at the Maple Harvest Festival and Children’s Halloween Trail. So those classes obviously haven’t happened, but a lot of our other Penn State classes have continued at different locations." Staff also have been visiting schools and continuing to take animals and programs to festivals around the state. And at Shaver's Creek, while staff continue to care for the animals on site, they've been paying close attention to the raptor center, where the birds' enclosures sit above the ongoing construction. "We're making sure their stress levels aren’t getting too high," Potter said. "They seem to be adapting well to the process. Some of the birds that are a little more sensitive to such things have been moved to enclosures at the top of the hill a little further away from the activity." Renovations to the raptor center, as well as the upper classroom, are planned for the second phase of the construction project. Potter said those are expected to place in the next year or two. "The raptor enclosures some of them are aging and are adequate now but we’re looking ahead," he said. "We want to reposition them because all the birds face north. That worked well when we set them up because people could walk around and look at the birds. But they like sunlight as much as we do so we’re looking at ways we can redesign the enclosures, put them a little higher on the hill and face them more to the south so the birds can have a higher quality of light." Planning for the renovations was done keeping in mind the affection many have for different aspects of the center. The trails will remain. The large white pine beloved by campers is protected by fencing throughout the construction. "People have been coming here for 42 years now and a lot of people, myself included, have a deep connection to this place. And one of the things you’re concerned about is the difficulty of change," Potter said. But the center also recognizes the chance to further expand its offerings for students and the community to connect with the outdoors. "This will really expand those opportunities and open up more diversity of ways for people to come out and different types of groups," Potter said. "Our next generation of learners will have a great place to come to." The new administrative building will be attached to the original main building, at left, with a landscaped terrace behind them. In the background is the new maintenance building. 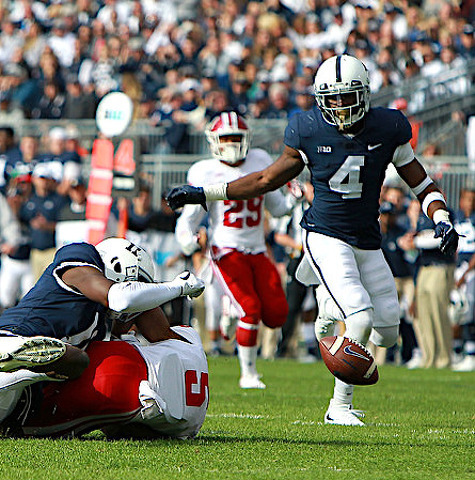 James Franklin is bullish on investing in special teams. “Very rewarding to me…that we’ve been investing in special teams in a lot of different ways...time, resources." — Sept. 2: Penn State 52, Akron 0.